Far Cry 5’s single-player campaign will be playable offline, and it has cosmetic and time-saver microtransactions. That’s a new trailer above, by the way. Thinking about playing with a buddy? Here’s what Far Cry 5’s co-op is like. That’s according to Ubisoft executive producer Dan Hay in a recent interview withGamespot. Hay says Far Cry 5 will have microtransactions for single-player, co-op, and head-to-head multiplayer, but he stresses no content is locked behind a paywall. Gamespot go on to say Far Cry 5’s microtransactions are cosmetic only, and will not affect gameplay. However, earlier in the article, they say Hay says real-money purchases are available for those who wish to speed up their game progress, which muddies the waters a little, depending on what you call ‘gameplay’. We reached out to Ubisoft for clarification. They say all in-game itemscan be acquired through gameplay. Theyalsosay there are items you can acquire through microtransactions “to save time,” but which aren’t necessary for progression. Exactlyhowthese items save you time was not made clear, but Assassin’s Creed Origins – another Ubi game – had a‘time savers’ category of microtransactionfor things like paying to unlock map icons, or buying crafting materials. 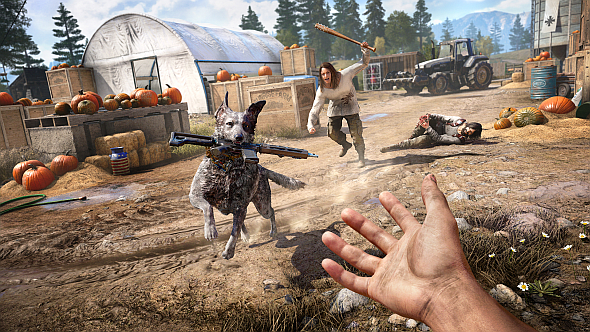 Ubisoft also explained that Far Cry 5 is the first time in the series that you’ll be able to customise your character, with new weapons, vehicles, and other gear unlocking as you progress through the game. Again, none of this is behind a paywall, though you can buy “premium customisation items” for real money. Ubisoft stress that they do not affect gameplay and are purely cosmetic. Far Cry 5 is out on March 27 –here’s the Steam page. This article has been updated with new comments from Ubisoft.